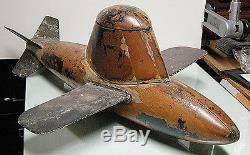 WWII or Pre WWII Military Ordnance Model. 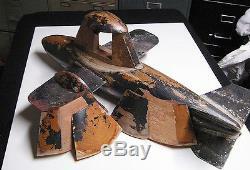 This piece is 33inches long with a wingspan of 25 inches. The wings are metal, and the body is mahogany. 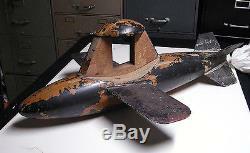 It appears to be a prototype of some type of military ordnance. Probably a scale model, not the actual size. There is a pocket that is revealed when the outside pieces are removed. Most likely for placement of instrumentation. It weighs about about 18 pounds. 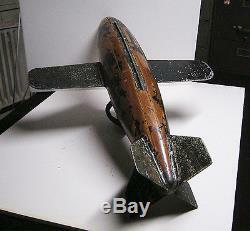 The item "WWII or Pre WWII Military Ordnance Model. One of a kind" is in sale since Thursday, April 20, 2017. This item is in the category "Collectibles\Militaria\WW II (1939-45)\Original Period Items\United States\Field Gear, Equipment". The seller is "indigobay" and is located in Middletown, Rhode Island. This item can be shipped worldwide.